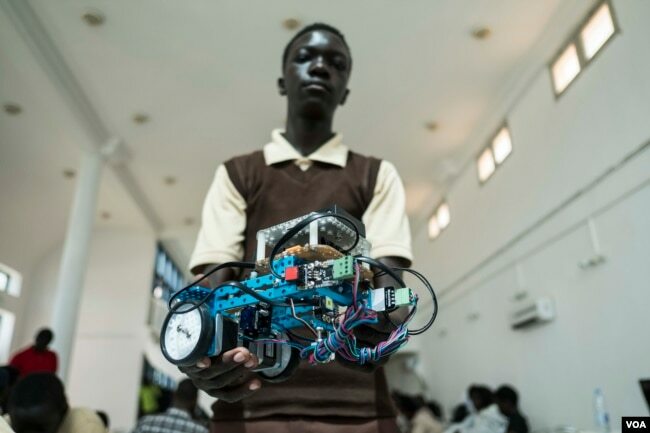 Organizers of the annual robotics competition say the goal is to encourage African governments and private donors to invest more in science and math education throughout the continent. Dakar, Senegal (May 19, 2017) - Rokyaha Cisse, 17, from Dakar, adjusts her team's robot at the 2017 Pan-African Robotics Competition in Dakar, Senegal. Their robot sends sounds into the ground, which detect the presence of metal. Dakara, May 24, 2017: The hum of tiny machines fills a fenced-off obstacle course, as small robots compete to gather mock natural resources such as diamonds and gold. The robots were built by teams of young people gathered in Dakar for the annual Pan-African Robotics Competition. 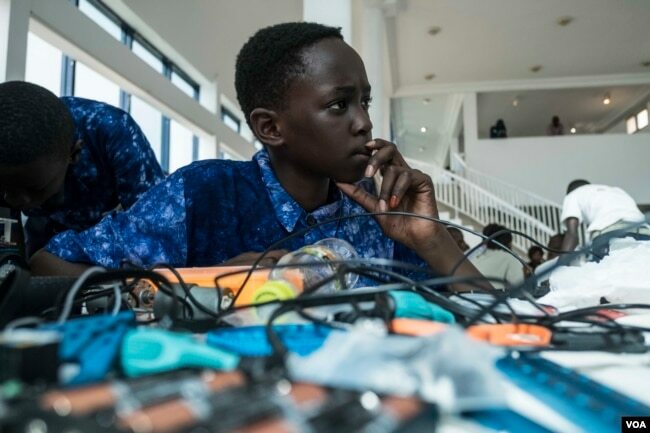 They’re among the several hundred middle school and high school students from Senegal and surrounding countries who spent last week in Dakar building robots. Organizers of the annual robotics competition say the goal is to encourage African governments and private donors to invest more in science and math education throughout the continent. The event’s founder, Sidy Ndao, says this year’s theme is “Made in Africa,” and focuses on how robotics developed in Africa could help local economies. During the week, the students were split into three groups. The first group worked on robots that could automate warehouses. The second created machines that could mine natural resources, and the third group was tasked to come up with a new African product and describe how to build it. Seventeen-year-old Rokyaha Cisse from Senegal helped her team develop a robot that sends sound waves into the ground to detect the presence of metals and then start digging. Cisse says it is very interesting and fun, and they are learning new things, as well as having their first opportunity to handle robots. As part of a younger team, Aboubacar Savage from Gambia said their robot communicates with computers. The event’s founder, Ndao, is originally from Senegal, but is now a professor at the University of Nebraska’s Lincoln College of Engineering in the United States. A winning team was named in each category, but Ndao hopes the real winners will be science and technology in Africa. The organizers of the Next Einstein Forum, which held its annual global gathering last year in Senegal, said Africa is currently missing out on $4 billion a year by having to outsource jobs in science, technology, engineering, and mathematics to expatriates.